Painting abstract art is my addiction and meditation. I’m addicted to the smell of blank canvas, to the infinite possibilities within it. When I paint there is the feeling like I’m desperately searching for something. I don’t necessarily know what I’m looking for but it’s the search that keeps me coming back. It is a mystery I may never solve, but this addiction tempts me to compulsively continue my search. In my meditation I try to balance spontaneity and restraint’s let things flow and evolve, while simultaneously trusting my judgement to know when to stop. My process follows this practice. I paint organically, non-linear and devoid of a plan for the outcome. While painting there’s a feeling of digging and searching for significance to reveal itself. My job is to then capture it, but using restraint and self-control to stop in the right moment is the most difficult part of the process. Some of my paintings resemble nature, space or organic material, but I always approach a piece from a non-representational standpoint. Texture and its relationship with light fascinates me and there is an elusive and mysterious quality to the depth and contrast that texture creates. My aim as a painter is to structure the colors, shapes, texture and light in a compositionally significant manner to highlight this mystery through ethereal and mystical imagery. Her works are personal and emotional narratives yet also universal in theme. The titles give clues: Re-birth from the Marrow. A Magical Re-connection After Many Years and Dark Waters. Dark Water was inspired by the horrific Deep Horizon oil spill. It’s essentially a prayer for our oceans. HISTORY Santos Cage Dolls take their name from the Spanish word for saint. Priest of the l7th century carved and later brought the dolls to Latin America. They were used in processions during holy days to aid in the conversion of Native Americans to Catholicism. CORSET CROSS STITCH SERIES The Corset Cross Stitch Series is an abstract representation of the corsets used in the l800’s to slim the body and make it conform to a fashionable silhouette. Women were so tightly laced that they could breathe only with the top part of their lungs, causing the bottom part of their lungs to fill with mucus. Side effects included a persistent cough, as well as heavy breathing, causing a heaving appearance of the bosom. The smallest waist on record is l3 inches. EMPOWERMENT SERIES In these times of tumultuous women’s issues, potential exists for great change. The Empowerment Series is about recognizing and claiming the power that women already possess. Power is not bestowed. The making of quilts has been a way for women to bond in support of each other. Women are awakening to the realization that true power is an inside job. THE WOMAN IN THE MIDDLE This collaborative piece represents how women are literally in the middle of great change. We invited women in the community to express their own personal experience with regards to empowerment. They were asked where have you found it, and where have you missed it? The skirt is made up from their responses. Thanks to Kraig Lysek and Gizmo for their help in making the exhibit come to life. August's show is brought to us by Helveticka. July's show features the solo exhibit of Julie Gautier-Downes. Performance artist Lou Lou Pink invites you to donate an article of clothing — preferably one you are wearing — which she will use to create a large narrative scroll. You can participate by placing your article of clothing into one of the wooden trunks. The articles of clothing function as surrogates for the individuals contributing to the developing narrative. The narrative representing the underlying connectedness of humanity, while embracing an exchange of human experience and unity. Lou Lou’s goal is to travel across the U.S., visiting several other locations along the way, continually adding to the scroll at each destination. Her final stop will be Washington D.C. where, in front of the White House, she will unroll the scroll — now a massive beautiful visual landscape — as an important reminder of the fusion that exists within us all. This group show combines the work of five artists: Anna Carpenter, Remelisa Cullitan, May Kytonen, Margaret Mount, and Eva Silverstone as well as the community group Craftivists of the Inland Northwest. Each of the artists are working in their own way to remix fiber traditions in order to explore a variety of concepts including identity, femininity, body, community, and fiber itself in the role of art. Join us April 6th for the opening of the month long show Neighborhood by Michael Dinning. Michael believes that our lives are assemblages of the people, places and events that we choose to hold close, and that we need to return to, again and again, as we navigate the world around us. Our identities are constructed with these intriguing little bits and pieces, because they compel us, bring us joy, and define the way that we want to see ourselves, and how others see us. Neighborhoods are eclectic, messy, chaotic. They are the places where we interact with others, and they are the places where we keep our secrets. They keep our history, give us a sense of place, intrigue us with light and sound, movement and music. Life can be as mundane as a morning commute, or as joyous as a dance to drive away the rain. Our neighborhoods are filled with secrets, and often strife, but in the end there is a beat of life, a rhythm of existence, that keeps it all compelling, intriguing and lled with light. This is a light of life which illuminates the world around, and glows within us all. More than anything, “Neighborhood” is his homage to this light, which he keeps returning to, constantly entrancing, perpetually present and a never-ending source of energy and joy. Remember Cabby Barnard’s and Tiffany Kendrick’s balloon room from Terrain 4? How about Alan Chatham’s Choose-Your-Own-Adventure pay phone from Terrain 7? Or Terrain’s youngest artist ever, 8-year-old Olive Pete’s series from Terrain 8? What about Divine Jewels' Scapeskin performance from Terrain 5? Or Chase Halland’s debut of his now nationally renown bucks from Terrain 6? In honor of Terrain's 10th Anniversary, we’ve put together a gallery show looking back at noteworthy pieces/performance from past Terrain events. Representing at least one piece from every year and featuring the work of 33 different artists, join us as we replay some of the most memorable moments of the past decade. This show will run from February 9th to March 24th. The gallery is open Thursday through Saturday, 5:00 PM to 7:00 PM. This is a FREE show. A place, like an image, is a composition of elements connected in time and space. These elements can look drastically different spending on your angle of view, and of course, things change over time. From almost any angle, Spokane is changing incredibly quickly. 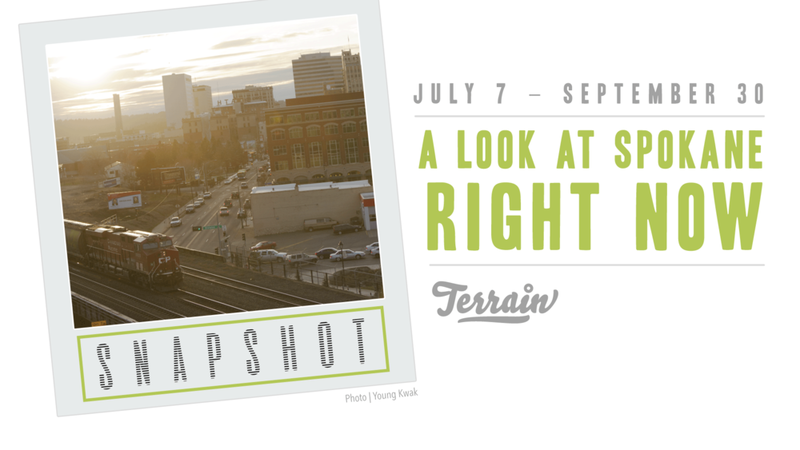 Our hope with Snapshot was to capture this moment in the life of our city from many perspectives, so that we can see as comprehensively as possible the way Spokane looks to its people. We wanted to celebrate the Spokane we saw emerging — the tremendous growth, the pride, the enthusiasm — but we also wanted to challenge ourselves as a community to ensure this change makes Spokane a more hopeful place for everyone. To that end, we asked local professional photographers from all walks of life to shoot the Spokane they see every day. With the help of a Sponsorship from the Smith Barbieri Progressive Fund we were able to give away 15 digital cameras to Crosswalk of Spokane and to Global Neighborhood to add to the perspectives of how we see Spokane. We also encouraged the entire community to contribute to the project by using the hashtag #snapshotspokane to be featured on our community wall. We are hoping to revisit this exhibit again the future so keep using the hashtag #snapshotspokane and you might end up in our gallery. Framed photos by Young Kwak, Rajah Bose, Robert Lloyd, Grace Lindsey, Kristen Black & Laree Weaver, community wall photos by you. Heather Hart, an interdisciplinary artist from Brooklyn, NY will be featured in the Terrain Gallerywill participate in a number of community events from February 21 to 24 that showcase her talent of combining art with social practice. She is interested in creating site-specific liminal spaces for personal reclamation. Her work questions dominant cultural narratives and offers alternatives to them. New stories are created through Hart’s thoughtful proposed interactions, these experiences are a starting place for rebuilding history – a renewed platform to reshape or strengthen cultural identity. Her work makes use of large immersive sculptures that invite a very physical level of interactivity or can provide a more intimate experience with secluded spaces and participatory drawings. For her, this interactivity is key to the message of transition and change that is embedded within her art. Hey. You. How’ve you been feeling the last couple of days? Despondent? Emboldened? Terrified? Relieved? Terrain wants to hear from you. All of you. We’d love for you to create something that reflects these emotions. It can be a poem. A drawing. A song. A letter. Collage. Dance. Sculpture. Anything and everything is welcome. Each person gets a 1’x1’ space. Open to everyone.